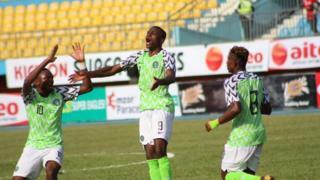 Nigeria Under-23 team don progress to di final round of qualification for di 2019 Africa Cup of Nations after dem win Libya 4-0. Victor Osimhen score hat-trick and David Okereke late goal epp di team overturn di first leg 0-2 loss to win di match 4-2 on aggregate. Nigeria been nid notin less than three or more goals for dem to progress to di next round of qualification after Libya win di first leg for Tunisia. Osimhen wey join di Dream Team VII from di senior national team, di Super Eagles score di first of im three goals for di 31st minute wen im pounce on loose ball inside di box. Im come later score di second just after di hour mark before im complete im hat-trick nine minutes from time. As if dat one no dey enough, David Okereke come add one more inside di 90th minute to end any hopes wey Libya get to qualify. Nigeria go play di winner between Sudan and Kenya for di third and final round of qualification for di AFCON tournament wey Egypt go host later dis year. How we fit stop malaria?